The Commodity Channel Index (“CCI”) measures the variation of a security’s price from its statistical mean. High values show that prices are unusually high compared to average prices whereas low values indicate that prices are unusually low. Contrary to its name, the CCI can be used effectively on any type of security, not just commodities. The CCI was developed by Donald Lambert. There are two basic methods of interpreting the CCI: looking for divergences and as an overbought/oversold indicator. A divergence occurs when the security’s prices are making new highs while the CCI is failing to surpass its previous highs. This classic divergence is usually followed by a correction in the security’s price. The CCI typically oscillates between 100. To use the CCI as an overbought/oversold indicator, readings above +100 imply an overbought condition (and a pending price correction) while readings below -100 imply an oversold condition (and a pending rally). 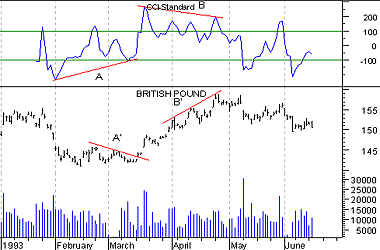 The following chart shows the British Pound and its 14-day CCI. A bullish divergence occurred at point “A” (prices were declining as the CCI was advancing). Prices subsequently rallied. A bearish divergence occurred at point “B” (prices were advancing while the CCI was declining). Prices corrected. Note too, that each of these divergences occurred at extreme levels (i.e., above +100 or below -100) making them even more significant. A complete explanation of the CCI calculation is beyond the scope of this book. Add each period’s high, low, and close and divide this sum by 3. This is the typical price. Calculate an n-period simple moving average of the typical prices computed in Step 1. For each of the prior n-periods, subtract today’s Step 2 value from Step 1’s value n days ago. For example, if you were calculating a 5-day CCI, you would perform five subtractions using today’s Step 2 value. Further details on the contents and interpretation of the CCI can be found in an article by Donald Lambert that appeared in the October 1980 issue of Commodities (now known as Futures) Magazine.